Pesto can be used for many things. It can be added to sauces, cream or broth. Used as a rub for searing fish. As salad dressing ingredient or seasoning for veggies. 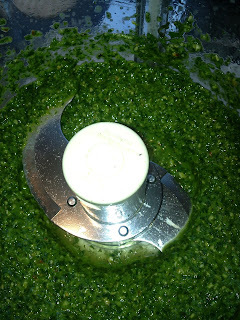 Pesto is also not limited to basil, garlic and pine nuts. Cilantro and pumpkin seed is nice or parsley and garlic, spinach walnut, sun-dried tomato and garlic, the list goes on. I also like to make pesto up ahead of time and keep it in the freezer!! No matter what flavor you prefer this recipe is basic and interchangeable. 2) place all ingredients into blender or food processor and blend until its a paste!! !